Welcome to Eastview's Secondary School ARTS & CULTURE and BUSINESS Specialist High Skills Majors informational website. Discover the possibilities! Experience your FUTURE and Participate in SHSM! So.... What is a SHSM anyway? 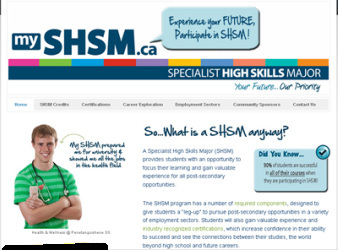 Click to discover all about SHSM's at SCDSB. myshsm.ca. Learn more about Eastview's Arts SHSM or Business SHSM - BEST. Are you currently enrolled as a SHSM student? Need to Stay Connected? Check out the SHSM Calendar (below) for upcoming reach ahead, experiential learning and certification training dates. Don't miss out! Read What's New! and What's Coming Up. If you are a Grade 10 student interested in our SHSM programs here at Eastview, visit Guidance today and pick up an application form or Apply Online for the Business SHSM - BEST. Questions? Contact us, we will be glad to help. Click to Discover the Possibilities!